4 percent of cycling accidents result from dogs running in front of cyclists and/or dogs attacking cyclists while riding. 7 percent of cycling accidents involve two bicycles or a bicycle and a pedestrian. 13 percent of accidents are caused by bad roads or pathways. 17 percent of cycling accidents are caused by falls; however, these accidents often involve children and/or are instigated by a motor vehicle causing them to swerve. 29 percent (the most percentage) of cycling accidents are caused by collisions with motor vehicles. Facial injuries can include a break or fracture in the jaw or nose, teeth knocked out, or even eyes lost. Scrapes to the face can cause road rash, permanent scarring, and other damage. Commonly reported broken bones include the wrists, arms, ankles, legs, and collarbones. With nothing to restrain cyclists in high-impact collisions, they are often ejected onto the road or nearby objects. This can be damaging to the spinal cord and result in fractured vertebrae, nerve damage, or displaced discs. Back injuries can be difficult to recover from and may end up in resulting chronic pain or paralysis. A cyclist thrown over the handlebars or impacted in certain ways will have a difficult time catching the fall. Common head injuries include skull fractures and concussions. Brain injuries are usually the most extreme and serious. While wearing a helmet can greatly reduce the impact to the brain, a high-impact collision often leaves protected cyclists injured. Traumatic brain injury can occur and may be permanently debilitating. If you are in a bicycle accident, always tend to any immediate medical concerns first. If injuries are severe, you should call 911 immediately and receive appropriate attention from a medical professional. Some injuries can be treated on site, while others require an ER visit. A police report is one of the most useful documents a lawyer can have when defending your claim. Furthermore, police serve as a valuable mediator between yourself and the other party involved. Unless you are receiving necessary and immediate medical attention, you should wait for the police to arrive on the site of the accident. For best results in a court hearing, having your side of the story taken down on the police report is key. Often times, your first statements are held in the highest regard, as small facts and details will be forgotten down the road. If possible, gather contact information of unbiased individuals whom witnessed the accident and encourage them to speak with the appropriate authorities. Write down everything you remember leading up to and during the event. Keep track of all negative impacts and medical treatments received due to the bicycle accident. Take photos if possible and leave your bicycle unrepaired to give your lawyer and other experts comprehensive access to the physical evidence. 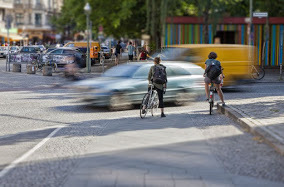 Successful cases that include bicycle-related injuries require professionals that have extensive knowledge in areas such as bike traffic laws, bicycle manufacturers, parts and their relevant values, and who can get a network of expert witnesses who are knowledgeable in areas like motor vehicle physics and injury rehabilitation. Personal injury claims of this type are specific and require knowledge and experience in this area. Contact a bicycle accident attorney in the event of a crash caused by negligence or wrongdoing of a motor vehicle operator.